Bethany continues touring in support of the CD’s release with scheduled stops bringing him to the midwest and east coast in late Summer and early Fall. 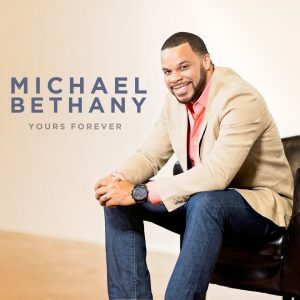 Michael Bethany has been a fixture on the music stage for some 15 years, working with top Gospel acts including Fred Hammond, Marvin Sapp, Tamela Mann, Myron Butler and Kirk Franklin. The singer/songwriter and worship leader comes into his own with the release of Yours Forever, his debut CD across digital outlets. The Stellar Award nominated songwriter and BMI Award recipient collaborates with Calvin Rogers and Phillip Feaster to produce 11 tracks that run the gamut of musical styles from high-energy praise, intimate worship, artistic, and intense gospel. Leading people into worship has become a passion for Bethany as he travels around the globe helping people to experience God’s presence. The Dallas, Texas resident finds great joy in his post as Executive Director of Worship at the Oak Cliff Bible Fellowship Church under the leadership of senior pastor, Dr. Tony Evans. Bethany will make several appearances in support of the CD’s release including this year’s EK Bailey Preaching Conference in Dallas.